Author(s) Allan, Keith; Jaszczolt, Kasia M.
Pragmatics is the study of human communication: the choices speakers make to express their intended meaning and the kinds of inferences that hearers draw from an utterance in the context of its use. This Handbook surveys pragmatics from different perspectives, presenting the main theories in pragmatic research, incorporating seminal research as well as cutting-edge solutions. 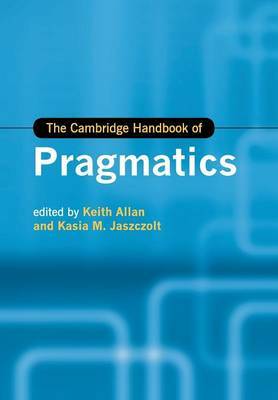 It addresses questions of rational and empirical research methods, what counts as an adequate and successful pragmatic theory, and how to go about answering problems raised in pragmatic theory. In the fast-developing field of pragmatics, this Handbook fills the gap in the market for a one-stop resource to the wide scope of today's research and the intricacy of the many theoretical debates. It is an authoritative guide for graduate students and researchers with its focus on the areas and theories that will mark progress in pragmatic research in the future.